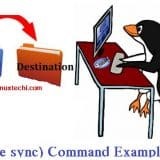 KVM (Kernel-based Virtual Machine) is an open source full virtualization solution for Linux like systems, KVM provides virtualization functionality using the virtualization extensions like Intel VT or AMD-V. 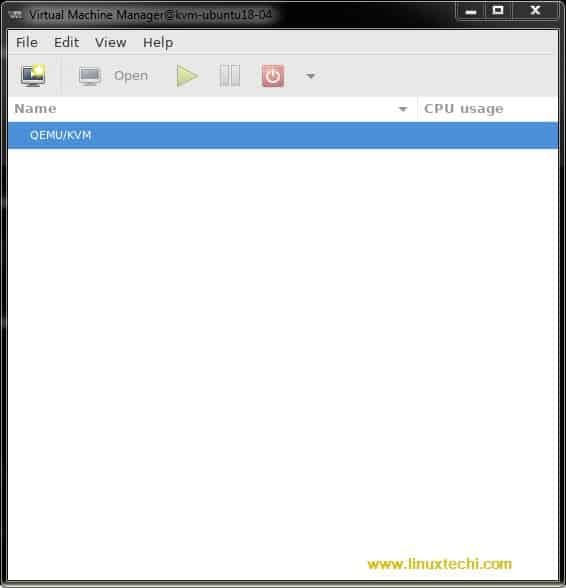 Whenever we install KVM on any linux box then it turns it into the hyervisor by loading the kernel modules like kvm-intel.ko( for intel based machines) and kvm-amd.ko ( for amd based machines). 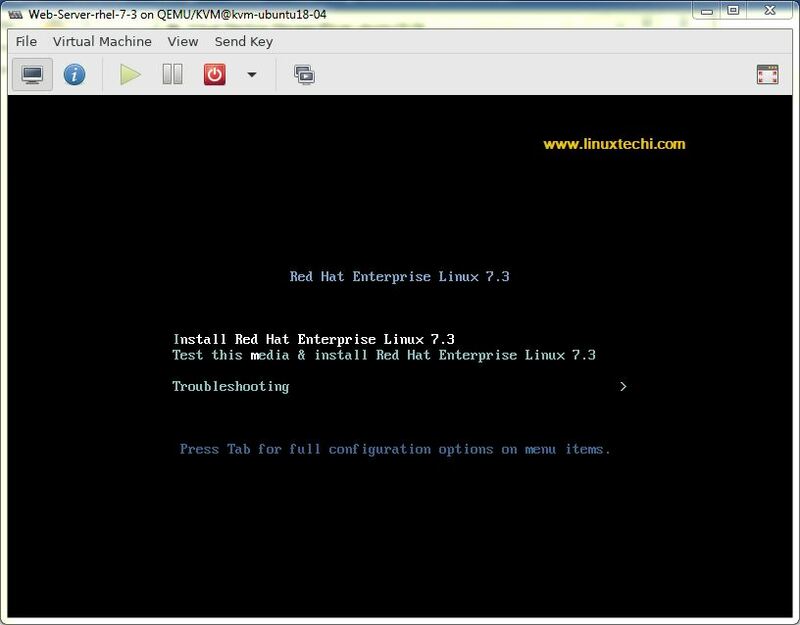 KVM allows us to install and run multiple virtual machines (Windows & Linux). 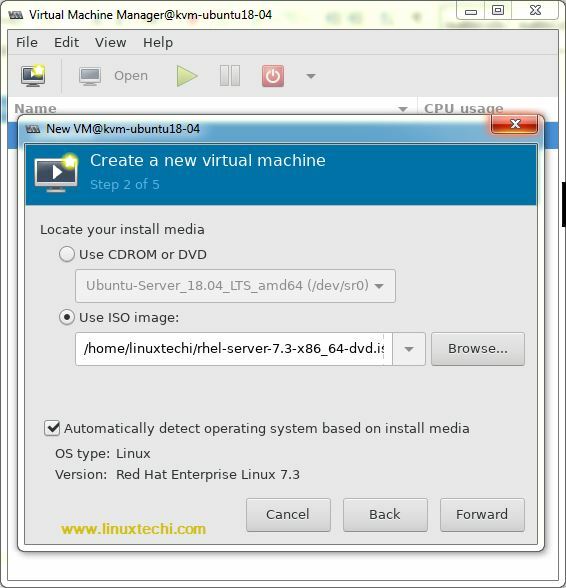 We can create and manage KVM based virtual machines either via virt-manager graphical user interface or virt-install & virsh cli commands. 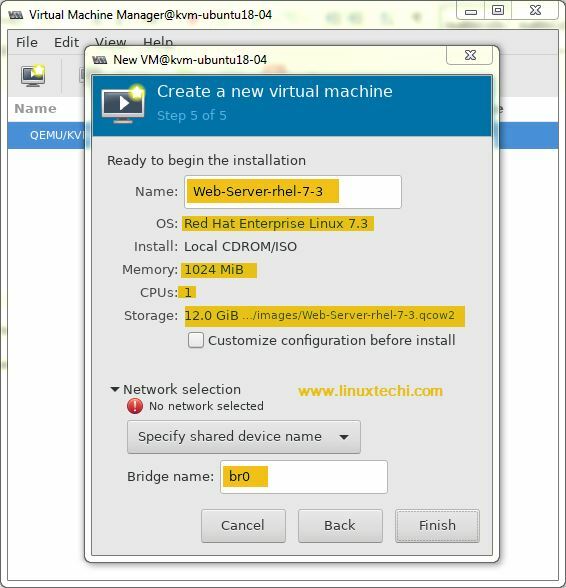 In this article we will discuss how to install and configure KVM hypervisor on Ubuntu 18.04 LTS server. 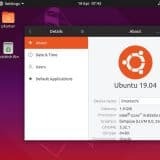 I am assuming you have already installed Ubuntu 18.04 LTS server on your system. 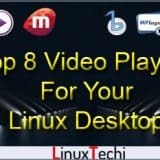 Login to your server and perform the following steps. If the output is greater than 0 then it means your system supports Virtualization else reboot your system, then go to BIOS settings and enable VT technology. 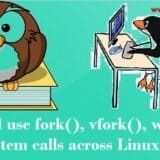 Once the above packages are installed successfully, then your local user (In my case linuxtechi) will be added to the group libvirtd automatically. 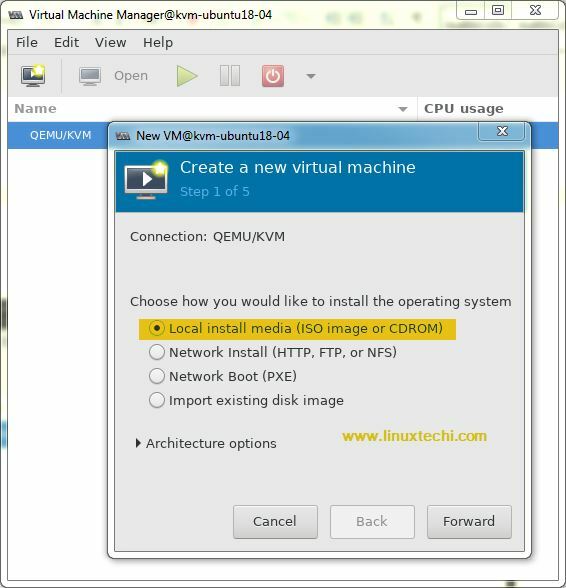 Network bridge is required to access the KVM based virtual machines outside the KVM hypervisor or host. In Ubuntu 18.04, network is managed by netplan utility, whenever we freshly installed Ubuntu 18.04 server then a file with name “/etc/netplan/50-cloud-init.yaml” is created automatically, to configure static IP and bridge, netplan utility will refer this file. 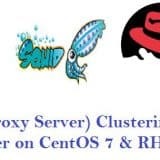 Click on forward and select the ISO file, in my case I am using RHEL 7.3 iso file. In the next couple of windows, you will be prompted to specify the RAM, CPU and disk for the VM. 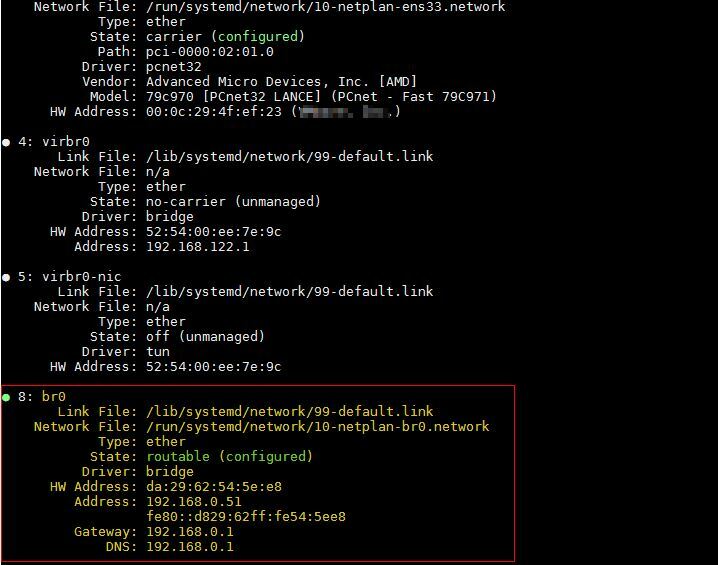 Use the below virt-install command to create a VM from terminal, it will start the installation in CLI, replace the name of the VM, description, location of ISO file and network bridge as per your setup. 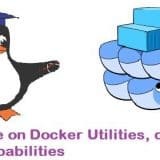 That’s conclude the article, I hope this article help you to install KVM on your Ubuntu 18.04 Server. Apart from this, KVM is the default hypervisor for Openstack. Great article.. straight to the point.. I think it is better to remove netplan and use networkd to configure network including bridges. But thanks for how to use netplan for creating bridges. Now I know it. If you are using netplan, you are using networkd. Sorry if this is sill question but why do we configure the br0 with a static IP and not the hardware interface ens33? 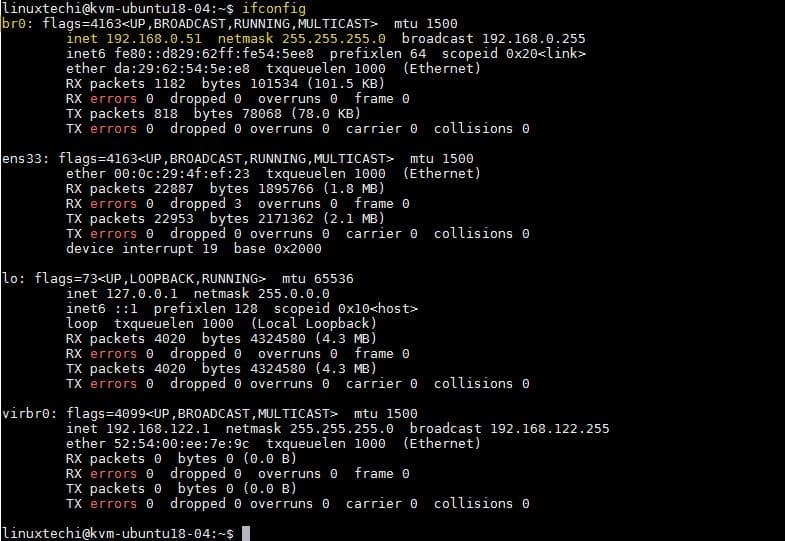 Does this result in the host and the guest OS using the same IP? 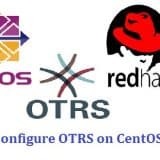 If you want your virtual machines to be accessed from outside of KVM host then you need to create a bridge, remove the IP from eth0 or ens33 and assign the same ip to bridge interface. 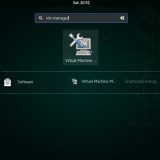 Map VMs interface to the bridge either via command line or virt-manager.After that you can assign the IP from the VLAN which is associated to bridge. Everything seemed to work, but I don’t see the new vm assigned its own IP via dhcp as I expected. Anyone have a luce as to why it’s not starting?